We’ve got expert advice on the benefits of prenatal yoga poses. Walmart sits down with Jamie Kalynuik, a certified yoga instructor who specializes in pregnancy and postnatal movement, as she shares her tips and ideas on how you can help prepare your body for this most exciting time in a woman’s life. Consult your healthcare provider to ensure a new exercise program is right for you. Exercising may be harmful if you have any medical problems or pregnancy-related conditions. Speak with your yoga instructor and let them know how far along you are in your pregnancy so they can advise you accordingly. Never do anything that doesn’t feel right. Expecting a baby is one of the most beautiful experiences life has to offer a woman, and yet it also comes with its share of growing pains—take it from this mom of four, who has experienced three different pregnancies (including my double-trouble twin boys). Fortunately, I discovered prenatal yoga early in my first pregnancy. After consulting with my healthcare provider and yoga instructor, I practised prenatal yoga during each of my pregnancies to help manage pregnancy-related aches, pains and anxieties. I couldn’t wait to chat with Kalynuik to get her take on the matter. Jamie Kalynuik is the founder of Yoga Mamas, Toronto’s leading prenatal and postnatal wellness centre. Kalynuik is a certified yoga instructor specializing in pregnancy and postnatal movement. She brings a blend of strengthening and stretching poses into her classes, while also focusing on the importance of the breath and relaxation. She is a DONA trained birth doula and has supported many women during their pregnancies. Both on the mat and during labour, Kalynuik encourages women to focus on the moment, invite a few gentle challenges in for exploration, and embrace all experiences with compassion. She takes great joy in leading her business, is passionate about working with women on their pregnancy journeys, and is expecting her first baby in February. What yoga poses are unsafe during pregnancy? Does prenatal yoga really help with labour? When should you start prenatal yoga? If your yoga mat isn’t very thick, or if you have sensitive knees, Kalynuik suggests using a blanket that you fold up to help create additional padding for the knees. This 100% cotton throw with herringbone stripe by Fabstyles is fringed. It measures 50 inches by 60 inches and is available in a variety of colours. While prenatal yoga has plenty of benefits for new moms, there are yoga poses that can be unsafe during pregnancy. According to Kalynuik, deep back-bends that stretch the abdominal muscles are also not recommended. “This area of your body is stretching the most already and overstretching it will increase diastasis recti,” she explains. Kalynuik recommends avoiding closed twists where the belly is compressed. “You can replace these with open twists where the movement originates from the upper back and shoulders, allowing room for the belly,” she advises. A good yoga mat is essential for your practice, says Kalynuik, who recommends one with traction to help prevent you from slipping. Look for one that’s thicker, with more padding for added comfort. This extra-thick 5/8-inch mat by Zenzation Athletics will help protect your spine while exercising. It is dual textured (vertical ribbed and flat texture) to help guard against slippage. Includes stretchable straps to roll up and go. When asked how often an expectant mom should practise prenatal yoga, Kalynuik recommends that three times a week is ideal. “You should have a mix of in studio and at home,” she suggests. Be sure to bring your water bottle to your practice, she adds, and sip as you go. “You need to stay hydrated during each prenatal yoga session,” advises Kalynuik. 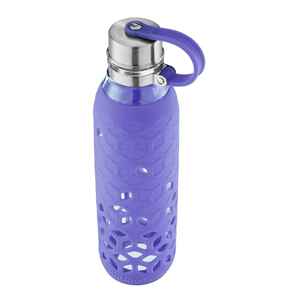 Stay hydrated with this 20-ounce glass water bottle with petal sleeve by Contigo. The BPA-free purity glass water bottle features a stylish silicone sleeve to help protect the glass bottle. Its attached silicone lid creates a convenient carry loop, and the wide mouth makes it easy to add ice cubes before your prenatal yoga session. Comes with a limited lifetime guarantee. “It can,” says Kalynuik. “Prenatal yoga can be an amazing way to help prepare both your mind and body for all of the physical and emotional work involved throughout the birthing process,” she says. A yoga block offers expectant moms height to create space for moms and babies, and breath as well. This yoga tool is recommended for poses where you might need additional support as you practise prenatal yoga. This lightweight yoga block with bevelled edges is made of EVA foam construction. It is designed to provide stability and balance as it helps to support and cushion your body. You might want to use a bolster or pillow for more restorative yoga poses like Child’s Pose, says Kalynuik. “A good memory foam pillow, one that has more structure, can help support you in that pose. It can make it easier to get into that restorative pose without overstretching, and gives you something to lie into,” she says. This premium memory foam pillow by Obusforme will conform to the shape of your body for customized comfort. From helping to calm the mind to preparing the body for labour, prenatal yoga can offer many health benefits to expectant moms and their unborn babies. Following this expert’s prenatal yoga advice may provide an opportunity for you to build an early bond with your baby. It may also help bring some much-needed comfort to your growing body and assist in calming your mind as you prepare yourself for the big day. Keep in mind that everyone’s pregnancy is different. Make sure to check with your healthcare provider before starting any new exercise program and do what’s right for you.